It is possible to merge invoices or to add a new voice to an existing invoice in Nookal. See the step by step instructions below. Make sure the invoices are in the same Case because they cannot be merged otherwise. See Editing an Existing Invoice for more information. 1. Open the Client Accounts, see Using the Client Account Section for assistance accessing this section. 2. Click Merge Invoices at the bottom right of the page. 3. Select the appropriate Invoices by ticking the boxes on the left side next to each invoice. Use the Filters option to specify a Case. Merging invoices will void the selected invoices and compile them into a new invoice – this is an irreversible process so please make these selections carefully. 5. Click OK on the Warning pop up window (this will look different depending on the web browser). 6. 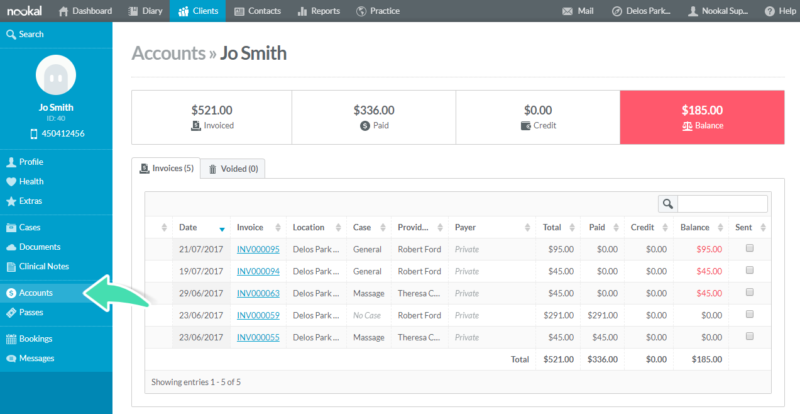 Click Cancel once invoices have been merged to go back to the Client Accounts page. This will not cancel the merger. The newly merged invoices will be shown with an icon to the left of the Date section. When hovering over this icon, it will indicate that this is a Merged Invoice. 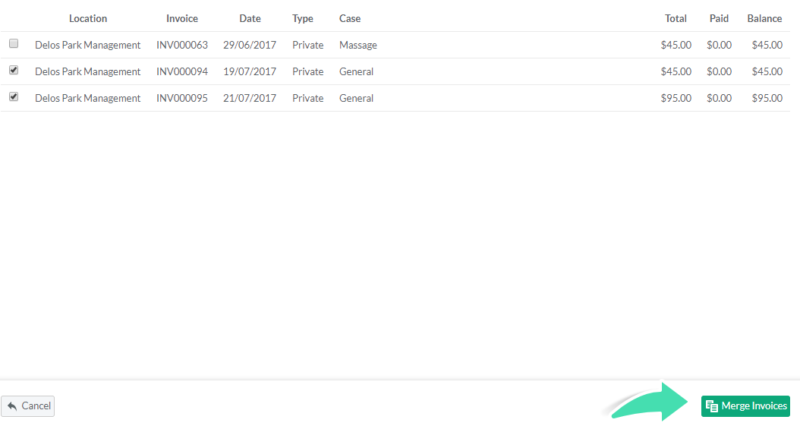 When generating an invoice for an Appointment/Class on the Diary, it is possible to add the invoice to an existing invoice instead of creating a new invoice. This option is only available if an Unpaid Invoice has already been generated for the same Case within the last 30 days. 1. In the Create Invoice page, instead of saving and/or printing the invoice, click Add to Existing Invoice at the bottom right. 2. Select the blue + icon of the appropriate invoice. Once the invoice has been added to an existing invoice, the page will be redirected to the Diary. To see the invoice, open the appointment window and click Invoice Raised. It is only possible to merge or add to an existing invoice that has been generated within the previous month. To merge older invoices, create a support ticket with the merge details.